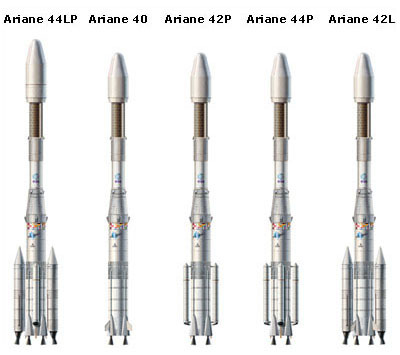 Ariane 4 is justly known as the ‘workhorse’ of the Ariane family. Since its first flight on 15 June 1988 it has made over 100 successful launches. The Ariane 4 has proved ideal for launching satellites for communications and Earth observation, as well as for scientific research. This launcher is extremely versatile. The first stage can hold two or four strap-on boosters, or none at all. This means that it can lift into orbit satellites weighing from 2000 to nearly 4800 kg in GTO, nearly three times as much as the Ariane-3 launcher. Now its role is gradually being taken over by the Ariane-5 launcher and the last Ariane-4 flight is expected to take place in 2003. Ariane 4 has captured 50% of the market in launching commercial satellites showing that Europe can more than hold its own in the commercial launch market.